We'd love to get to know you! As a growing company, we are always looking for talented, ambitious employees (with and without work experience) who want to participate in our mission of realizing challenging architecture around the world. Will you become our new, result-oriented team player who contributes to making our projects a success? We are a 'design & build' company. Unique in the Netherlands. Our work shows that a diverse and creative team can successfully realize unique concepts and thus contribute to a sustainable and inspiring environment for everyone. We mainly rely on people, our people. 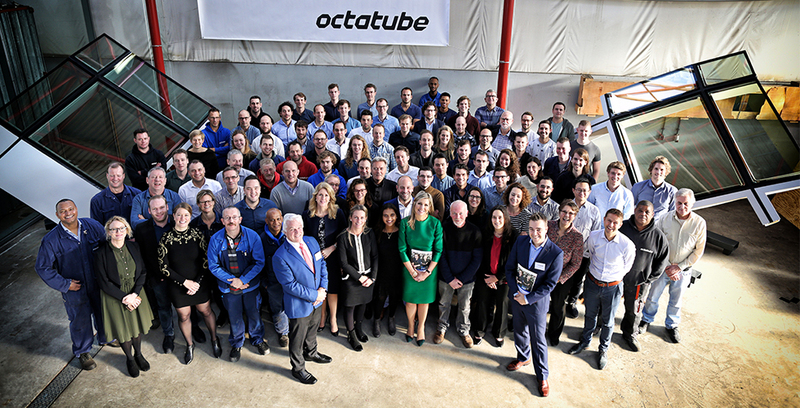 Our employees have the knowledge, drive and guts that give Octatube its reputation. After all, the qualities of our employees determine the overall success of our projects. We develop from the inside out, offering mentorship and ongoing training. We use the most advanced technologies. These leading practices enable us to create an ideal environment for our teams and projects. At Octatube we believe it's important that we continue to challenge our people and achieve goals together. There are countless opportunities for career development to senior roles or other roles because of the multidisciplinary character of Octatube. You can also do an internship or a graduation project with us. It all depends on what ambitions and talents you have and how we can best support you. Octatube is a family business. This is reflected in the way we interact with each other. A positive atmosphere prevails where you can easily feel at home. Throughout the year we organise various fun outings and every Friday we organize a 'borrel' because we believe that besides hard work there should be time for fun. For some outings, your partner and children are also very welcome. As we said, we are a family business. Does this appeal to you? Apply to one of our vacancies! If you are not sure whether your knowledge and experience are fully in line with the position, please contact us, we would love to hear from you and who knows, you may become our next colleague. On Novenber 17th 2017, her Majesty Queen Máxima together with State Secretary Keijzer visited Octatube to learn about the work we do. A memorable day for Octatube!